We’re going to talk about the evolution of the female dancer! As titles go, it might seem like I’m really grabbing at straws with “Beautiful Gorgeous Feminine Vortex” but there’s a great back story to it and some interesting insight into the stages that make up the development of the most amazing social dancers you will ever have the pleasure of sharing a dance-floor with. So I’m sitting in a cafe in Barcelona with my buddy Tyler who I haven’t seen in almost 3 years, since my days back in Cali, Colombia. Tyler and I share a ridiculous amount in common. We both have backgrounds in martial arts which had led us to live in Asia for a time (Tyler in China and me in Japan), we both had decided that there was more to life than slaving away at a job we hated so we decided to travel instead and we both ended up in Cali, to do the same 2 things; learn Spanish and, more importantly, dance! So, it was great to catch up with him after such a long time and hear the stories of his adventures over the past few years. After catching up, the conversation naturally turned to women (as has been known to happen when men are speaking with each other 😉 ). Tyler is what I would call a very spiritually evolved individual and he suddenly started talking about 3 different types of women he had met in his life, each one an evolution from the previous with the final, most evolved, most balanced form described by him as this “beautiful gorgeous feminine vortex“! I have no idea how he came up with the term. More than likely he just pulled it out of his a$$ right there and then… but it stuck with me. So how does this relate to dance? Type 1 is the earliest, most basic form of the female dancer. She is content with just leaving the man lead and following along. She has no real interest in doing shines or anything with too much flair. She may be technically very, very good (or not) but her main goal is to get through the dance in the most uneventful way possible. She doesn’t particularly feel any need to contribute to the creativity of the dance and so all dances with her might appear to be very, very similar. More than anything else, this type is defined by both a lack of self confidence and a lack of emotion while dancing. Type 2 is an evolution from Type 1. The easiest way to conceptualize this dancer is to imagine a high powered female executive. She is brimming with confidence and drive to achieve her goals. She has worked hard to achieve the level of skill she has attained and she wants people to know how good she really is. So much so that she might actually come off as aggressive or bossy on the dance floor. She’s not happy with the idea of a man leading her entirely in the dance and will often break away herself to do the shines she wants to do, the way she wants to do them. She want’s to dominate in the dance, to prove that she can do everything, at the expense of her partner. Once again, her dances are probably technically wonderful but they can probably make her partner feel like he was just an afterthought, a tool necessary to actually achieve the dance, but not an integral part of it. This is the final evolution of the female dancer. She has been through the other stages and learned a great deal from them. She is confident and aware of what she is capable of (which is a great deal) but she has tempered that confidence with the ability to allow herself to happily be led on the dance floor. That said, she contributes to the creativity of the dance with her energy, her shines, her flair and the connection she creates with her partner. This is what sets her apart from the other two types; the connection that she allows herself to become part of. She isn’t concerned with how she looks or what else is going on around her, she is there, in the moment, totally present. The dance is neither about her nor her partner. The dance is what they both create, together, with the music, in a continuous game of give and take that is unique every time you dance with her. After a dance with this evolved, balanced dancer both people walk way feeling that they gained something from the dance, from the connection that was momentarily created. This is the Beautiful Gorgeous Feminine Vortex! There is nothing quite like a dance with a Beautiful Gorgeous Feminine Vortex. I once wrote an article called “The Cloudy Dancer” that spoke more of the technical side of dancing with a wonderful dancer like a Type 3. However, in this article I’m getting more into the “why” regarding other factors and not just the actual skill level. Let’s be honest, just because someone is a wonderful “technical” dancer doesn’t mean you are going to fully enjoy a dance with them on the level I’m talking about here . The connection that is created is essential to reach the highest levels of dance pleasure and enjoyment. That connection is what creates unforgettable dance experiences. With all that said I bet there are a few people, just starting out in the world of dance, thinking that none of this applies to them. I would say, “think again”. While technical ability has its part to play in creating a great dance, connection is what makes dances memorable and you don’t need to be the greatest dancer in the world to establish that connection. 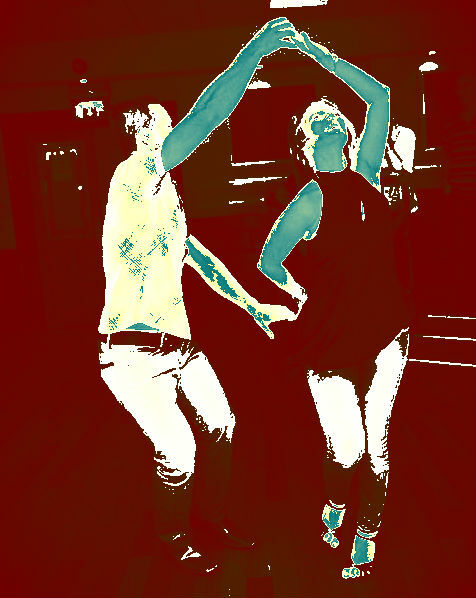 That said, time, practice and experience will feed themselves into the evolution of every dancer provided they don’t get bogged down in one of the other stages, meaning everyone has that potential for incredible dances on a technical and connection-based level. What about ’em? … Just kidding 😉 . Leads too, go through an evolution in their dancing. My buddy, Tyler has also put them into 3 groups but that’s for another article entirely (if I get round to it). Suffice it to say that the ultimate dance can be had when both partners have evolved to stage 3, where both are willing to be part of something more than the sum of their parts. Where the connection is real and both partners contribute and no-one dominates. Now that sounds like a great dance to me.